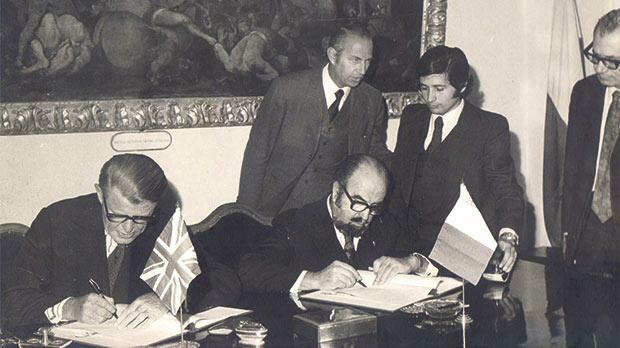 The signing of the 1975 UK-Malta health agreement, paving the way for free medical services for Maltese patients in the UK. From left: British High Commissioner W. Hayden, Dr Albert Hyzler, J. Darmanin from the Foreign Office, Tony DeBono and Alfred Grech. On November 20, 1916, Albert Victor Hyzler was born in Valletta to a distinguished household of artists and parliamentarians. “Bertu”, as he was affectionately known, was one of the most prominent politicians of Malta of the post-World War II era. His father Giuseppe Hyzler, a lecturer and expert in forensic medicine at the University of Malta and examiner in anatomy, surgery and mental diseases at our Alma Mater. His mother was Marietta Muscat Fenech, who also belonged to a well-known family. His Maltese progenitor, Johann Fredrick Risler, who married Aloisia Barbara at the parish church of St Domenic in Valletta on July 9, 1720, had arrived in Malta from Deggendorf, Bavaria, Germany. His collateral ancestors included the Nazarene painter brothers Giuseppe and Vincenzo Hyzler, lawyer Francesco Hyzler, and the priests Antonio Hyzler, Domenico Hyzler and Matteo Hyzler. He was nephew to Dr Emmanuele Hyzler, and first cousin to Dr George Hyzler, who was another deputy. Dr Albert Hyzler in his office at the Ministry of Health, 1975. Albert was set to follow in the footsteps of his father and braced himself from his student days at the Lyceum to matriculate to the Faculty of Medicine within the groves of Academe. He successfully graduated in medicine in 1942 at the height of World War II that devastated in many ways the harbour area towns and outlying villages through aerial bombardments and especially the consequent abnormal rise of outbreaks of disease due to lack of washing facilities. Hyzler had as his ‘clinic’ from the beginning of his career the Economical Dispensary in St Sebastian Street corner with St Joseph Street in Qormi. He was professionally a veritable run in the family but was also politically bound to chip the old block. He began to see his patients at a pharmacy that was very popular in the course of the belligerent period because its owner, Is-Sur Ġann Meli, was known for an ointment against scabies and other contagious skin infections, which he compounded and sold in great quantities. Hyzler exploited the concoction as a very effective recipe among electors. He entered politics inevitably by contesting with his father’s Democratic Action Party in 1947. He was elected to the Legislative Assembly that was restored as a unicameral legislature in the aftermath of the international armed conflict. Indeed, Hyzler’s first experience as a representative of the people was very short since the House dissolved prematurely in 1950. He was returned with Paolo Boffa’s Malta Workers Party that formed a partnership government with the Nationalists. He was appointed Minister of Health, yet he persistently opposed George Borg Olivier and, in the end, voted against his own leader so that he was forced to tender his resignation after three years. Hyzler joined the Malta Labour Party in 1953 and always garnered a large number of first preferences to secure for himself a seat in Parliament. He was a rara avis in the Maltese political arena, given that he managed to be a deputy within the folds of three ideologically different movements. Hyzler was entrusted by Dom Mintoff with the portfolio of health and social services and was main spokesman on so fundamental transferred matters within the Legislative Assembly from 1955 to 1958. He masterminded and piloted all-important legislative enactments, particularly the National Insurance and National Assistance Acts. He was re-nominated as Minister for Development (1971-1974) and Minister of Health (1974-1976). He was instrumental in the signing of two milestone pacts with the then Italian Minister of Communications establishing international telecommunications transmissions as an integral part of technical co-operation with Italy, and with the British government allowing 250 patients to be given treatment free of charge in the United Kingdom – a remarkable, money-saving achievement 40 years ago. In his dual role, he was a trouble-shooter for the passage of a new and enabling Medical Health Act, coupled with ancillary measures. 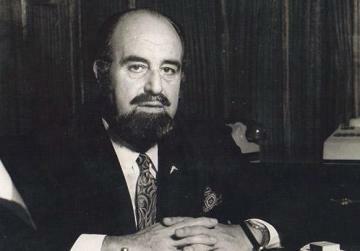 He was bolstered by a fabulous entourage of bright comrades, such as his young, budding private secretary Anthony Debono, whose baptism of fire led to a remarkable career in public office with mentors like the formidable George Borg (former private secretary to George Borg Olivier) and the dynamic Chief Government Medical Officer Alfred Grech, and with close collaborators like, for instance, the indefatigable trade unionists Joe Borg, Manwel Gili as well as Jack Calamatta. Hyzler ensured the finalisation of major projects and initiatives which he ushered in during his tenure of office. He certainly gave pride of place to the inauguration of the Boffa and Ruzar Briffa hospitals in Malta and the Craig General Hospital in Gozo, comprising a re-modernisation of operating theatres; the Intensive Therapy Unit (ITU) and the Hydrotherapy Unit that boasted the latest sophisticated equipment at the time; and, last but not least, the Caesium Unit for cancer patients in St Luke’s Hospital. He also spearheaded the statutory institutionalisation of pension retirement schemes for port workers. He was responsible for sealing diplomatic relations with Algeria in the wake of direct encounters with President Houari Boumedienne. He was, therefore, a vital stepping stone towards the North African state’s donation of a foremost communications earth station to Malta. Hyzler retired from politics on September 20, 1976, and was a notable absentee from the polls of the same year. Nevertheless, he was once again called to serve his motherland in the capacity of acting president of the republic from December 27, 1981, to February 16, 1982. The MLP stalwart was totally dedicated and committed to his convictions and was, no doubt, conspicuous for his patriotic fervour and orientation. He was, alongside the late and lamented ministers Agatha Barbara (later Malta’s head of State) and Patrick Holland, arrested and jailed for 32 days for his involvement in the riots against the British administration on April 28, 1958. Hyzler was well-known for his singular temperament but indubitably for his charisma that compared with Mintoff’s extraordinary gift of the gab. Hyzlerused to delight and rejoice his listeners with his inborn intelligence, wit and sense of humour. His eloquence was the secret of his triumph every time his party fielded him as a candidate in nine consecutive plebiscites over 30 years. He was also a very prolific writer and was already putting pen to paper as a regular contributor to the MLP organ Is-Sebħ in the 1950s. “Bertu” was an excellent swimmer, and the Times of Malta’s photo of his somersault in Nassau in the Bahamas remained embedded in the memory of all and sundry. He loved waterpolo and was a staunch supporter of Neptunes WPC. He was a bosom friend of Joe Attard Kingswell, secretary general of the General Workers’ Union, and plenipotentiary ambassador at the time. Albert married Mary Rose Petrocochino in the presence of Archbishop Michael Gonzi, on April 29, 1944, in the chapel of the spiritual leader’s palace in Valletta. Mary Rose was socially a quasi-twin sister of Lady Mamo and, among other joint undertakings, co-founded the Corradino Handicapped Centre. Albert passed away on October 26, 1993, and was buried at the Santa Marija Addolorata Cemetery. Raymond Mangion studied at the University of Malta and the University of Oxford, and is a graduate in literature, linguistics, communication studies, patrology, law and history.